← Racing on the River: Tambo backs 150 years of winners! MDO Lydia Egunnike began her NAIDOC week by attending the launch of a new exhibition celebrating the extraordinary sporting history of Cherbourg, a small town in the South Burnett region. Cherbourg, or Barambah as it was originally called, was established by Salvation Army member William Thompson in 1899. It became a Government Settlement in 1904. Under the “Aboriginal Protection Act” Aboriginal people from across Queensland and New South Wales were relocated to Cherbourg. From its beginnings, the community produced an exceptional number of local, state and national champions across a wide range of sports. Many of the surrounding communities recruited team members from Cherbourg. The Ration Shed museum celebrates this history in their new exhibition “Play the ball”. The day began at the Cherbourg cemetery with the poignant unveiling of a new headstone for Frank “Big Shot” Fisher, a Cherbourg legend, and rugby league great. After a hearty morning tea, the “Play the ball” exhibition was launched with the cutting of the ribbon by former local ruby league player Uncle Cecil Brown. Chris Sarra (on behalf of the Australian Rugby League Commission) presented a presentation plaque celebrating the Cherbourg rugby league “Team of the Century”. “Play the ball” shares the triumphant and moving stories of Cherbourg’s sporting champions and unsung heroes. The exhibition uses a vibrant mix of photographic, oral history and audio-visual content. A number of original objects such as trophies are also on display. The audience is encouraged to reflect upon the social, political, and cultural context in which these sporting achievements occurred. They are also reminded of the potential power of sports to instil pride and bring communities together. The exhibition has been developed as “a reconciliation process for Cherbourg and surrounding communities, a display of local pride in achievement, an affirmation of prowess and ability, and a demonstration of what is possible to the community youth.” (http://rationshed.com.au/play-the-ball-the-story-of-sport-in-cherbourg/). 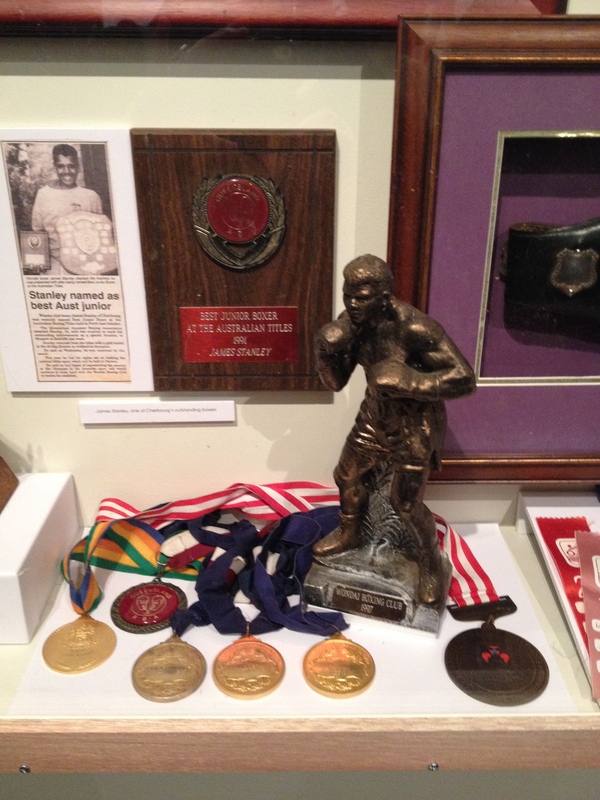 Cherbourg boxer, James Stanley’s trophies. Posted on 15 July 2014, in Lydia's Diary, Uncategorized and tagged Cherbourg, exhibition, NAIDOC week, Ration Shed Museum, Ration Shed Precinct, sport. Bookmark the permalink. Leave a comment.